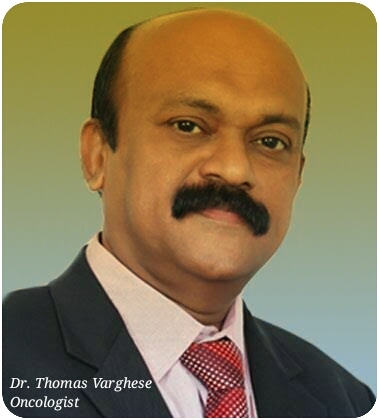 When Dr Thomas Varghese trained at the Tata Memorial Cancer hospital in Mumbai and developer of the Varghese technique in cancer surgery, started his practice from Kochi, Kerala, little did the people of Kerala know about him. Having proved himself in a short time to be a great trained oncologist surgeon from Kochi, he gives valuable advice to people on how to prevent cancer. According to Dr Thomas, urbanisation and food intake are the greatest threat mankind is facing which limits his working life and his restful life out of office hours. Dr. Varghese says that of all human food intake, white sugar, salt, milk, maida (American flour) and white polished rice are the greatest reasons for cancer of different kinds, not forgetting redmeat. Salted foods, snacks are great promoters of cancer in human beings. Not taking more food and having more frequent and less food intake, not snacks or packaged food, can also ensure that we lead healthy lives. Avoiding processed and packaged food can also be a positive step to a healthy life. Urbanisation has resulted in humans leading a very subdued and less active life (with no exercises). This also found to be another great contributor to cancer. Proper walking and other body relaxation and stretching exercises is a good antidote to the early onset of cancer. Environmental pollution which includes air and water pollution, is the modern day cancer agent. From his vast experience at Tata Memorial Cancer Hospital in Mumbai, Dr Thomas has seen many instances of cancer of the liver and the kidneys among people living on the banks of Ganges and Yamuna river. This talks of how unwarranted pollution of two famous and large rivers in India has been a health risk to the people staying on the banks of these two rivers. Having listened to many of Dr Thomas' speeches, it is opined that more of vegetables, fruits, fibrous foods and curds with enough of fish (with easily digestible fats) with enough opportunities for lots of exercises for the body and the mind, including yoga, can ensure that we keep cancer at bay.